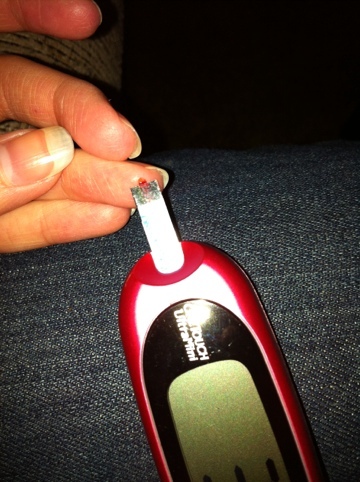 There’s a lot of change happening at one time when it comes to how I manage my diabetes. First there’s the new insurance, the new year and the coming of the new OmniPods. Those things kind of coincided into a minor panic the other day. With the new insurance, ordering my pump supplies in 3-month shipments is not the best option (hello deductible!). I halted all of my supply management orders for the time being in favor of more control over timing for not only insurance but for the new pods. The last thing I want is a backlog of old pods to push through when it’s my turn for the new system. I also didn’t want to order more before the calendar year rolled over and I had a whole new deductible to meet. It already hurt my brain to have to order another medication before the year ended and count toward a 2012 deductible that would never get met. So after the first of the year, I ordered one month’s worth of pods logged all of my new insurance information and waiting for a shipping confirmation. My order went into pending status for a couple of days before I received an email telling me to call and pay for my pods before they’d ship. I was already nervous before that because my supply was dwindling but that order date had to be a 2013 date. By the time I received a shipping confirmation I was down to two OmniPods (plus the one stuck to my arm). Now, stocked for the next month with pods, I feel better and the deductible that I have to deal with for 2013 is already smaller. I would rather stick myself with a blunt lancet over and over than talk to the insurance company. I have never liked dealing with insurance companies because apparently there’s all sorts of subtext in policies that no one gives the insured. Recently, we applied for an additional life insurance and I was denied based on “type 1 diabetes and a history of insulin use” (redundant much?). Then to add insult to injury, we received a denied claim from our health insurance out of the blue. My husband and I have had fantastic healthcare coverage, until another branch of the company started administering the EXACT SAME POLICY that we had before and started denying coverage for my testing supplies.